Bob has been (Officially) covering the Penguins since September 1981, when he began a 17-year career as the hockey writer at the Washington (Pa.) Observer-Reporter. He also served as co-host on the Penguins Radio Network for 8 seasons. His book, Pittsburgh Penguins: The Official History of the First 30 Years, was published in 1997. (If any one wants to sell me a copy, please let me know) He also has contributed to two other books, Total Hockey (Second Edition) and The Game I’ll Never Forget/100 Hockey Stars’ Stories, in addition to GOAL Magazine, Hockey Digest, Beckett’s Hockey Monthly, the 1990 NHL All-Star Game program and IceTime, the Penguins’ official game program. I personally want to thank Bob for his injections of Penguins facts, stats and history that are relevant, thoughtful and entertaining. As well for being a consummate professional in addressing any questions I have, providing me resources and with wonderfully insightful knowledge. Who were/are some of the “Unsung Heroes” on the Penguins that never received much recognition or fanfare but were integral pieces to the team’s success? Most recently, it would be a trio of Minnesota natives. Given his age, Matt Cullen got a little more attention as the 2016 playoffs approached and played out, but right from the start of that championship season he was playing at a high level and contributing more and in more ways than was recognized. Paul Martin didn’t win a Cup in his five seasons here and sometimes had trouble staying healthy, but when he was in the lineup he almost always made a game full of little plays that showed his smarts. I thought Matt Niskanen never got the credit he deserved for re-directing his career here in Pittsburgh, realizing his potential and pushing to get better. I would also put two Cup-winning American defensemen, Rob Scuderi and Brooks Orpik, in that category. It wasn’t until later during the span of consecutive Cup Final appearances in 2008 and 2009 that Scuderi’s contributions began to get noticed by more people; he played some tough minutes and added a lot to those teams by executing the simple choice with great consistency. Orpik didn’t win all those Players’ Player awards from teammates for nothing. A really solid pro who always had the willingness to play a physical game but had to learn how to manage that desire. Not easy. When he came to the Penguins in 1985, Randy Cunneyworth was 24 and had played only a handful of NHL games vs. almost 300 in the AHL. Looked on paper like a career minor-leaguer. Spent some time on Mario’s line and produced like no one expected, all the while keeping his fiery attitude and willingness to mix it up. Another under-appreciated forward was Ron Schock. Solid penalty killer, honest player, durable and had that one big offensive season in 1974-75 that showed he had more skill than people realized. I would close with defensemen Dave Burrows and Russ Anderson. Burrows played a lot of minutes and blocked a lot of shots at a time when those metrics weren’t measured and valued the way they are today. And he did it consistently on some bad and mediocre teams. I’ll close it out the way I started with another Minnesota native in Anderson, who nearly went straight from college to the NHL when that was really a rarity. Physical and durable until his last couple of seasons here. No-nonsense and dependable. Who would make it on to an “All-Grove” Team and why? F Mario. No explanation needed. F Sid. Second Cup the ultimate testament to his work ethic and belief in himself. Will grind it out one night, put up five points the next. A winner who has excelled under a very intense microscope for a long time. F Jagr. His time here didn’t end pretty, but the passion and ability he demonstrated were remarkable. Frequently produced big goals at big times. D Coffey. Helped teach Pens how to win, and his skating, skill and confidence were a joy to witness. Almost criminal to have him and Mario on the same team. D Murphy. 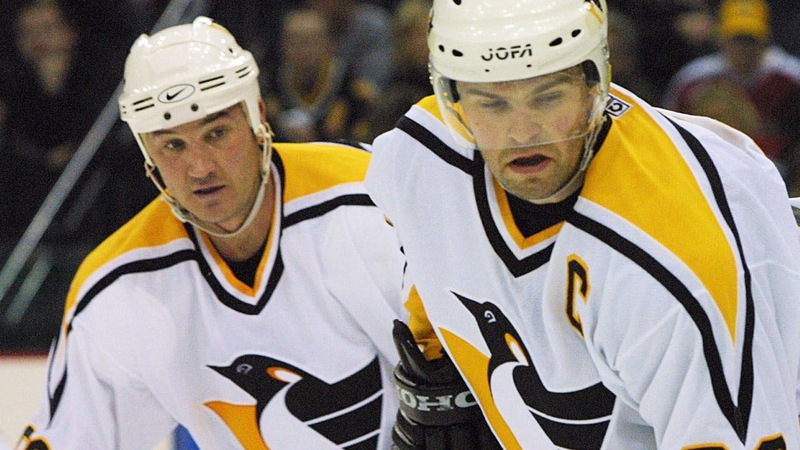 Phenomenal hockey IQ more than made up for some shortcomings in his game; his skill-set helped make the early 1990s Pens a lethal power play threat. G Fleury. Dealt some difficult cards early in his career, but kept a great disposition and developed into a Cup winner. Very durable until 2016 and never got the credit he deserved for rescuing his own career after 2013 playoffs. F Malkin. Jaw-dropping skills. Plays with his heart on his sleeve, which sometimes drives me crazy but always earns my respect because he cares. F Pronovost. Played both ends of the ice and excelled as a constant offensive threat in the 1970s. Worked himself into a 50-goal scorer. F Francis. Team player and leader who had fantastic ability with or without the puck. Dependable to a fault. D Letang. Despite some serious health issues, turned his fitness into a weapon. A crazy smooth skater with skill and strength. And determination. D Ulf Samuelsson. Defined playing on the edge, which meant he sometimes went over — much to the delight of Pittsburgh. He added the nasty Pens needed to win. G Barrasso. Couldn’t be judged by the numbers during his time here, given the era and philosophy of those teams, but he won two Cups and shut the door at critical times in the 1991 and 1992 playoffs. What are some of your first hockey memories? Watching highlights of the 1970 series between the Pens and Oakland Seals on a black and white TV set. Seeing my first game on Dec. 26, 1970 when Wally Boyer scored twice in a 4-2 home win over Bobby Orr and the Bruins. Orr, who played with a black eye that night, scored a goal. Listening to the Pens score five goals in 2:07 to beat the Blues in 1972. The soul-crushing Game 7 home loss to the Islanders in 1975. What fueled your desire and passion to become a Hockey Journalist? I was simply looking for a way to combine my love of the game with my love for writing and reporting. As short-sighted as it was, my goal was to cover the Penguins and I was fortunate to be doing that four months after I graduated from college. You are considered to be the Penguins “Resident” Statistician. How important do you think stats are to the narrative of a game and/or players? Given the explosion of analytics in recent years, and their use by so many teams, I think it’s easy to say they’ve never been more important. I love that those kinds of metrics have been developed and are continuing to evolve and interest so many people. But I have to add those numbers are not in my wheelhouse; I’m just comfortable with traditional numbers and maybe shaping them a bit around history. I’ve gravitated to the numbers largely because it’s the only way I can stay close to the team. Because of my full-time job, I didn’t have regular access to the players for many years and now have no access because I’m no longer a member of the media. So I don’t have the ability to do any storytelling, but I can track numbers and enjoy doing it. Today, stats can tell more of the story than ever before. But it’s important to remember they still tell only a part. I push stats out for the reasons enumerated above and because they can be effective ways to frame developments around a player or team or game. But I also believe some fans, traditional media, bloggers and analysts place too much focus on them. I think you can partially assess players and teams with a fair use of statistics; but the numbers never tell the whole story. To get that you need information about the working environment of a player or team, or information about a player’s personality, personal history, relationship to teammates and coaches, etc. Can you speak on some of the projects you are currently involved in/with? Nothing external at the moment, but always open to ideas. Every summer I spend time working on specific expansions of my own databases. This year it is documenting scores of every game after two periods (when is the last time Pens won in LA when trailing after two periods? Against which team has Pittsburgh lost the most games when leading after two?) and documenting all GWG for Sid and Geno, including which were “true” game-winners (i.e, last goal in a 1-goal game, penultimate goal in a 2-goal game that included an empty-netter).